Are Schmidt's days numbered on Apple's board? 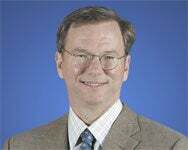 Google’s CEO Eric Schmidt said that he will talk to Apple about his role on its board of directors, in light of recent news that Google will get into the operating system business, reports Reuters. “I’ll talk to the Apple people. At the moment, there’s no change,” Schmidt said in a briefing with reporters at a technology conference in Sun Valley, Idaho on Thursday. Google, the company best known for its popular Internet search engine, earlier this week announced plans to launch an open source operating system called Chrome, the same name it uses for its own Web browser. Based around a Linux kernel, applications written for Chrome can be developed using standard Web programming languages. It’s yet another divergence for Google, which in 2008 began offering a mobile operating system called Android, a competitor for the iPhone that first debuted as the T-Mobile G1. Schmidt already recuses himself from board meetings where iPhone OS is discussed in order to avoid any conflict of interest. Schmidt’s involvement with Apple has already drawn the interest of the Federal Trade Commission (FTC), according to a report published in May by the New York Times. Antitrust law bars executives from serving on the boards of rival companies if it reduces competition between the firms. Schmidt said during Google’s annual shareholder meeting earlier this year that he has no plans to step down from Apple’s board. He has has sat on Apple’s board of directors since 2006.